Dove Brand Promises Dark Chocolate Hearts are made with only the finest premium cocoa beans to create a luxuriously smooth, rich chocolate taste. Delight in the decadence of Dove brand chocolate. Try our other silky smooth selections for a delicious chocolate experience. A chocolate experience like no other. Your moment. Your Dove. What's inside...per serving (about 6 servings per pack). Calories 220, 11% DV. Total fat 14g, 22% DV. Sat fat 8g, 40% DV. Sugars 19g. Sodium 0mg, 0% DV. GDA's are based on a 2,000 calorie diet. To learn more visit www.marshealthyliving.com. *No DV defined. www.cocoapro.com. Natural source of cocoa Flavanols. We value your questions or comments. Call 1-800-551-0704 or visit us at www.dovechocolate.com. Please save the unused product and wrapper. /TM trademarks Mars, Incorporated. 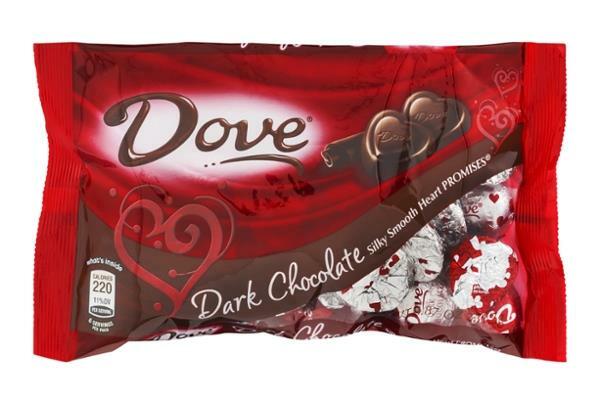 Dove Dark Chocolate Silky Smooth Heart Promises. What's inside. Calories 220, 11% DV per serving. 6 servings per pack. Semisweet Chocolate (Sugar, Chocolate, Chocolate Processed with Alkali, Cocoa Butter, Milkfat, Soy Lecithin, Natural and Artificial Flavors).